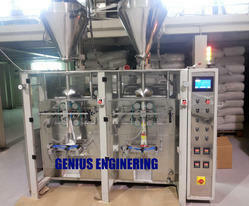 This Fully Automatic High Speed Powder Packaging Machine that are used to pack powder and granules. These machines have easy to use operating panels and avail up to 2 tracks. These machines operate intermittently and continuously with optimum electrical power. All these machines are constructed with mild steel and cladded with SS- 304. All these advanced machines are controlled by servo controllers or electromagnetic clutch and break and thus are able to draw films at the fast rate. Machine Speed (Bag Per Minute) 160 pouches per min. Our Twin collar type form fill & seal machine with servo driven auger is suitable to pack sticky & non sticky powders like milk powder, detergent powder, flour, spices, custard powder, oats powder & glucose powder etc. Speed: Up to 50gm Approx. 180 pouches per minute, up to 250gm: Approx. 100 pouches per minute, up to 1000gm: Approx. 60 pouches per minute, Up to 2000gm: Approx. 35 pouches per minute. 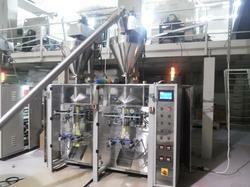 These both attached VFFS machines controlled by single operating panel. These machines operate intermittently and continuously with optimum electrical power. These machines are specially designed to produce double production output & occupy less floor space. Speed: Up to 50gm: Approx. 180 pouches per minute, up to 250gm: Approx. 100 pouches per minute, up to 1000gm: Approx. 60 pouches per minute, Up to 2000gm: Approx. 35 pouches per minute. Packaging Details: Equipment fastened & supplied in sea worthy wooden pallets at an extra cost paid by buyer.